Last week at the Jazz Gallery in Midtown Manhattan, Reverso served up an aural feast to a receptive crowd. The gallery space, located on the top level of an older compact five story building along Broadway at 27th street, may have been considered a loft back in the day, and still retains some rustic industrial charm, like the elevator where a sign implores that you do not dance or shake it while in motion. The atmosphere in the gallery space - which indeed hosts art shows as well - was the perfect setting for the American/French collaboration of trombonist Ryan Keberle (American) and Frank Woeste's (French) Reverso group playing the music from their debut release Ravel Suite, a set of original music that takes its inspiration from French composer Maurice Ravel’s music. 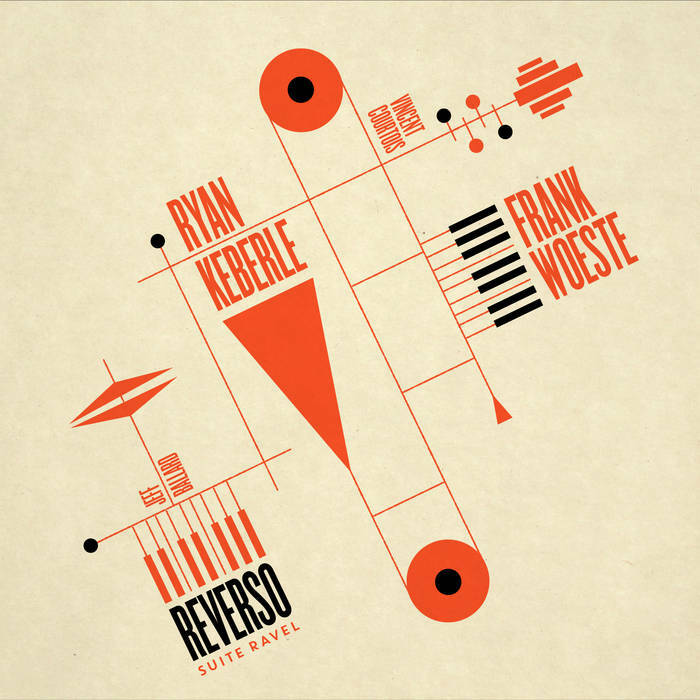 Woeste and Keberle met while working with trumpeter David Douglas in a sextet. Apparently a discussion between the two over Ravel, who at the turn of the 21st century famously remarked on the importance of American jazz, and whose influence on the modern jazz scene had not been given proper credit. Their response was to compose pieces that drew on Ravel's “Le tombeau de Couperin”, a suite for solo piano composed between 1914 and 1917. It was done more in spirit than in verisimilitude and paid particular attention to developing their music along the traditional Baroque suite style that Ravel had used. At this point, I must leave the Ravel references behind, as I am not familiar enough to speak with any real knowledge on it. So rather, while the concert featured cellist Erik Friedlander and drummer Adam Cruz (both American), the album, which was recorded in France, featured Vincent Courtois (French) on cello and Jeff Ballard on drums (American ex-pat), making the album a true Franco-American collaboration. Kicking off the concert, however, it was Friedlander who got things going. Against a wash of the drums, he began looping an arpeggiated pizzicato sequence and then bowing elongated tones over it. Woeste added a curt melody with one hand inside the piano damping the strings. Keberle then joined in with a brassy melody, helping bring on a crescendo. The cello and drums then picked up the pace, and Woeste comped uptempo and harmoniously - and the concert had truly begun. The song, ‘Ostinato’, which is also first on the album, just rockets past. The circular melody that outlines the general melodic approach is also quite an effective vehicle for improvisation. The solo trombone melody that opened the second piece, ‘All Ears’, was rife with feeling, but it was Friedlander’s carefully plucked notes that really brought out the overwhelming sense of grounded melancholy. Woeste’s keyboard work tended towards the lush and supportive, while Cruz gave the right amount of insistence and restraint, ready to push the energy when the timing was right. The cello and piano at times engaged in lovely counterpoint, and the ballad really exemplified their music: restrained, melodic, beautifully thought out, and above all, played perfectly. The album does not differ in terms of the principals: it too is provocative and melodic modern jazz with classical undertones. Moments of rock creep in as well, and certainly in concert some passages became heated. The last tune that they played in the first set was ‘Luminism', exemplified the creeping rock best, with strong syncopation. Friedlander and Cruz interlocked tightly into a fierce groove, and Keberle let loose with a tough and melodically strong solo. Like Woeste and Douglas’ Dada People collaboration from last year, Ravel Suite is one of those rare albums that you could potentially play at a dinner party (for cool people), and fits in just as well as in the racks of the Downtown Music Gallery. Check it out!